One in 4 women suffer a miscarriage or stillbirth. 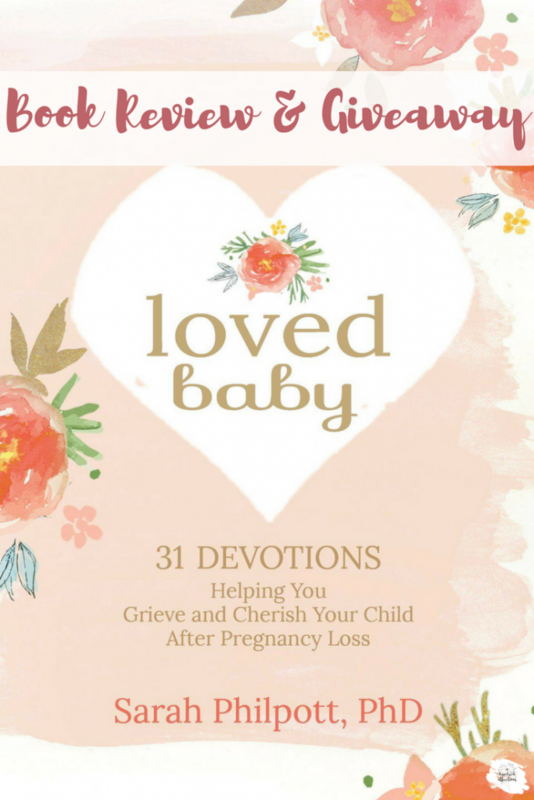 Today we are reviewing Loved Baby: 31 Devotions Helping You Grieve and Cherish Your Child After Pregnancy Loss by Sarah Philpott, PhD and hosting a giveaway of her book. Join us! I will never forget that year between October 2012 and November 2013. It started on the morning that Super Storm Sandy hit Long Island. And…I found out I was pregnant. I took 3 pregnancy tests that morning, just to confirm that I really was pregnant. I couldn’t get to the OB for a few days because of the storm, but they eventually confirmed. I actually was pregnant. Finally, the awaited day of my first sonogram came. I still was in disbelief and needed the visual proof that I was actually pregnant. Yes, the sonogram showed my sweet baby and his little heartbeat. But it also showed that my sweet little baby was in an enlarged yolk sac and had a heartbeat that was too slow. The nurse told me that, most likely, I would lose this baby. I walked out of that office, devastated, in tears before I even reached my car. My whole world was spinning around me. I shared the news with a few close friends and rallied the troops to pray for a miracle for our little baby. But a few days before Thanksgiving, I started spotting. It was happening. Then, on Thanksgiving Day, around the table with my family, the bleeding really started and I lost my baby. And no one even knew. Fast forward to September 2013. After one round of Clomid, we were pregnant again. I was over the moon – and filled with major anxiety. What if it happened again? This time around, our sonogram showed that our baby was a few days behind in development. The doctor assured us not to worry and that babies can catch up a few days. By the 8 week sonogram, our baby was 2 weeks behind; this time, the doctor said that it was unlikely that our baby could catch up from being 2 weeks behind. And, the heartbeat was only a ‘faint pulse.’ By 9 weeks, we had lost another one. I had negotiated the first miscarriage with grief and sadness, but I told myself, “A miscarriage isn’t uncommon – lots of women have them. Next time it will work out.” However, the second one gutted me. I was thrown into a whirlpool of grief that I had no idea how get out of. How I wish I had a copy of Loved Baby: 31 Devotionals to Help you Grieve and Cherish Your Child after Pregnancy Loss by Sarah Philpott. I managed to get to the other side of my grief with God’s help, but this book would have been a lifesaver. October is Pregnancy and Infant Loss Awareness month, and I’m really honored to be able to review this book and offer it as a giveaway. Loved Baby is such a comprehensive, sensitively-written book to help women go through the process of grieving the loss of their precious babies. Because miscarriage is often invisible to the outside world, many women go through this process alone (unfortunately). This book is like having a sister right beside you every step of the way, comforting you and showing you how to handle your grief in an empathetic, constructive way. As someone who has walked through miscarriage twice, I don’t think there is an aspect of this journey that Sarah hasn’t covered (and I use her first name because she really is like a sister in this book – and I think she’d want us to :). She deals with anger, guilt, anxiety, the physical questions, the spiritual questions. She talks about jealous feelings when seeing other women pregnant. She discusses how loss impacts marriage and how the father handles the grief. 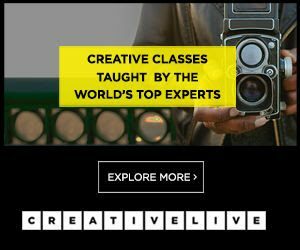 She also talks about life on the other side – trying to conceive, other family option choices, and how to cherish your baby as you move on with your life. This book is a step-by-step walk-through in crossing over to life beyond your loss. She literally covers it all. Sarah’s voice through this book is always compassionate. There is never a tone of judgment or things we should have or could have done to prevent our losses. It is always one of sitting beside you in your grief in an understanding, empathetic way. Even when she is communicating difficult truth, she does it in a way that is caring, sensitive, and empathetic. As she has walked through two losses herself and was later diagnosed with PCOS (Polycystic Ovary Syndrome), she has all the compassion in the world for women who are grieving. She also includes many stories from other women and their experiences. So many times as I was reading the book, I was thinking, “Yes! That’s it! Exactly!” All of the sudden, you are surrounded with a sisterhood that understands your grief and what you are going through. Several of those stories brought me to tears. She shares her own pregnancy loss stories – not the just details of the losses themselves, but how she handled it afterward – both emotionally and spiritually. She even vulnerably shares those times that she feels weren’t her ‘shining moments.’ She is totally relatable. It is also honest in a way that she doesn’t give fluffy answers to hard questions. She acknowledges that our questions might never be answered and we ultimately need to accept that. She doesn’t shy away from the difficult aspects of loss but coaches us through. She addresses the hard issues in an honest way, but always with compassion. Even in the darkest of grieving moments, Sarah encourages us that we will get to the other side. We might not be the same women as we were before, but she is always encouraging us that we will make it and that there will be joy for us again. While she acknowledges that the grieving journey is difficult, gut-wrenching and agonizing, she is always filling our cups with hope that we will get through this, and our lives will know joy and laughter again. 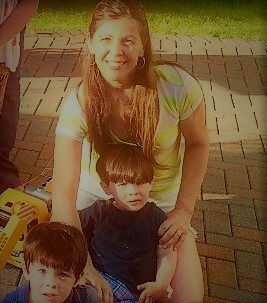 The biggest encouragement of all, at least for me – is that we will see our babies again. The little ones we lost were born straight into the Kingdom of God – and that has always been the hope that has kept me going. Sweet mama, our sanity rests on the premise that our life with this little one is not one of at true goodbye. We have the opportunity to embrace our child again in heaven” (85). There are SO many practical bits of advice and actions for women who have suffered loss. Each devotion ends with ‘Soul Work’ – things we can do to work through grief in a gentle, sensitive, practical, forward-moving way. It also has a prayer focus. I loved that the book offers not just compassionate, comforting words, but it also offers practical action steps to help the suffering woman move through her grief to the other side while, at the same time. honoring the little life that was taken too soon. As Sarah encourages, you will get to the other side of your grief. You will never forget, but the sting won’t always be there. I can attest to this. I still think of my babies, hang their snowflake ornaments on my Christmas tree, remember their due dates, think of how old they would be and what they would be doing. I also have a necklace with their birthstones in it that I wear. You never forget, but after time, it doesn’t hurt as much. I’m sure there are some women reading who have gone through pregnancy loss or know someone who has. One in 4 women experience this. This book is so, so helpful! You can purchase Loved Baby through Amazon (affiliate) or through Fashion and Compassion. 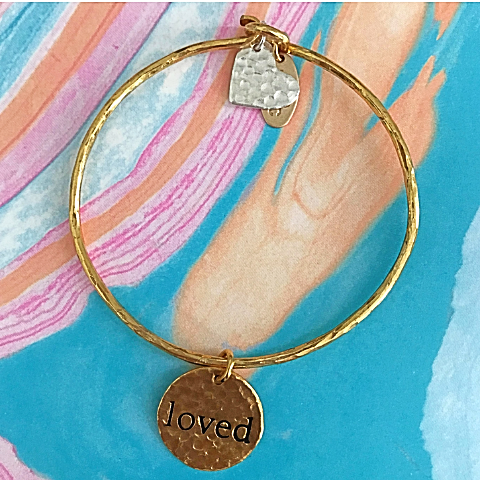 Fashion and Compassion is offering a beautiful dangle bracelet along with the book for a special price of $38 from Oct 2 – 25, 2017. Fill out the box below to subscribe to A Hundred Affections monthly newsletter. If you would like to put in a second entry, head on over and ‘like’ A Hundred Affections Facebook page. If you are already a subscriber, just fill out your info again below; this will go on a separate list for giveaway entries. If you already ‘like’ A Hundred Affections Facebook, you will automatically be entered a second time. The giveaway will close on Sunday, October 15, 2017 at midnight. Winners will be chosen and notified via email on Monday, October 16, 2017. Winners will have 48 hours to respond, or new winners will be chosen. If you are one of these women who have lost your baby too soon, you are so on my heart. I know what that loss is like, and my heart truly goes out to you. I would love to pray for you as well. Feel free to comment below if I can pray for you! *I was provided with free copies of the book for giveaway and review; all opinions here are my own. Thanks for the review, I once had a still birth in October and that was after I had a miscarriage a year before. I am glad someone is willing to talk about it. Thank you so much for sharing this book with us. Though I was fortunate never to have a miscarriage, my mother suffered several before carrying me to term, and it has colored the rest of her life, so I can only imagine how deeply you feel these losses. Your mom is a very strong, brave woman - and I'm sure you were such a blessing to her after her losses. It definitely changes us - and it can be channeled for good things (like helping others or being better moms than we might have been) if we let it! Thank you for coming by and sharing your mom's story, Flossie!